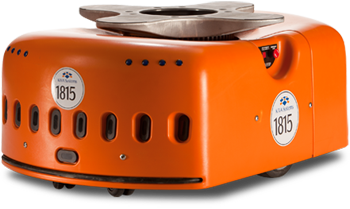 15K+ bright orange Kiva robots are operating across the US and at 10 Amazon fulfillment distribution centers this holiday season. Amazon has 109 shipping centers around the world, of which 10 use the technology and robots acquired when Amazon purchased Kiva Systems in March, 2012. In these 10 fulfillment distribution centers, new vision systems enable the unloading and receipt of an entire trailer of inventory in as little as 30 minutes instead of hours. Amazon is hiring 80K (80K!) seasonal employees to fulfill customer orders this holiday season, a 14 percent increase over last year. One of those 10 centers is in Tracy, California. It has 1.2 million square feet of space – massive by any standard. 3K of the orange robots briskly move around the warehouse carrying shelves full of Christmas goods to human pickers and packers near the truck doors – truly automated goods-to-man delivery – instead of humans having to run around the warehouse picking the goods and carrying them back to the shipping area. Each of the robots slide under and then lift shelves that are up to four feet wide and hold up to 750 pounds of merchandise. At the pick and pack area, high-end graphically oriented computer systems are used to help human workers fulfill orders with goods brought to them by the Kiva robots. Shelves are stacked dynamically and closely which means the warehouse can hold more goods. The Tracy center now holds about 20 million items, representing 3.5 million different products. It can ship 700K items in a day. Also, because the shelves are just a few feet high, the center doesn’t need to have high ceilings and costly ceiling-high storage racks and lift equipment.